Like nitrogen and phosphorus, sulfur is an essential element of life. At the origin of the Earth, sulfur was contained in igneous rocks, mainly in pyrite (FeS2). Degassing of the earth’s crust and subsequent aerobic weathering transferred a large amount of sulfur to the ocean in the form of SO42- . When SO4 is assimilated by organisms, it is reduced and converted to organic sulfur, which is an essential element of proteins. As in the case of nitrogen, microbial reactions are crucial in the sulfur cycle. 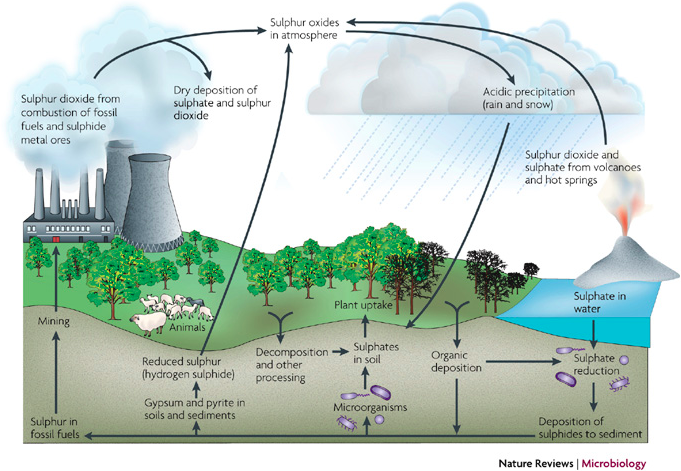 Understanding the global sulfur cycle is of great importance to the mineral economy and the debate on climate change and air pollution. Several metals, including copper, zinc, lead, are extracted from the sulphides of hydrothermal deposits. In some cases, microbial reactions are used to concentrate metal sulfides from dilute solutions. Sulfur is an important constituent of oils and coals and their combustion releases SO2 sulfur dioxide into the atmosphere. 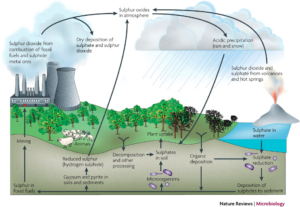 The ability to separate natural sources from anthropogenic sources of sulfur compounds in the atmosphere is fundamental to understanding the causes of acid rain and its impact on ecosystems. At the ocean cycle level, DMS is a natural product derived from the decomposition of phytoplankton cells in the upper ocean layer. It escapes into the atmosphere to form less than 1% of all atmospheric gases. Nevertheless, it has an influence on climates. Within a few days, it is oxidized to dioxide (SO2) and then to sulphate (SO4) which condenses into tiny aerosol particles. These act as nuclei for the formation of raindrops and clouds. These clouds will reflect some of the solar radiation and thus temper the warming of the planet. But they will also eventually contribute to acid rain because of the reaction of aerosols with water vapor and solar radiation. COS carbonyl sulphide is produced from organic sulphides dissolved in seawater and partly acquired from continental erosion. It escapes from the surface of the oceans to the atmosphere. It is inert in the troposphere, but oxidizes to sulphates in the stratosphere to form a layer all around the Planet. Just like the clouds of the troposphere, this layer of aerosol sulphates will reflect a part of the solar radiation, with the same effect of moderation on the heating of the Planet. Another important natural influence on the sulfur cycle is that of volcanoes. Among the gases that they emit into the stratosphere, there are the SO4 sulphates in addition to the aerosols that come from the COS. Coupled with ash emissions creating a haze effect, these sulphate emissions can result in very short-term cooling. Thus, it is estimated that the Pinatubo in the Philippines, which erupted in 1991, lowered the average global temperature by 1°C for one year due to the combined effect of ash and SO4 emissions . At the continental level, the alteration and erosion of metal sulphides, as well as the transport of sulphate dust (gypsum and anhydrite) in the desert, transfer sulfur to the oceans. Biogenic gases in anaerobic soils and swamps also contain H2S, as well as less DMS and COS, which are released into the atmosphere. But the greatest contribution to sulfur compounds comes from the burning of oils and coals that almost always contain sulfur. These are SO4 sulphate emissions, but mainly SO2 sulfur dioxide . This dioxide under the effect of solar radiation combines with water vapor and OH radicals to form tiny drops of H2SO4 (sulfuric acid), a process partly responsible for acid rain. The anthropogenic flux of these gases in many places exceeds the natural flux. We can say that globally the main flow in the exchange of sulfur between the surface of the Planet and the atmosphere is that of anthropic origin related to the combustion of hydrocarbons and coals.